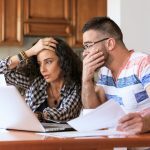 According to Manulife Bank of Canada’s annual debt survey, one in five Canadians try to avoid talking about money altogether. Although two in five Canadians do talk about money with their partner, half of them said those conversations can cause tension in their relationship. “The trick is to get these issues out in the open and having an open and frank discussion about them,” Lunny said in a release. Some indebted Canadians are also hiding purchases from their partners. One in 10 admitted to hiding a purchase from a loved one, and the same percentage have lied about about a purchase’s cost. While most of these purchases are under $1,000 (63 per cent), 8 per cent of men have hidden a purchase of $15,000 or more.